How do I email all of my campaign or event donors from GiveGab? First, navigate to your Admin Dashboard. Click the “You” in the top right corner and click “Admin Dashboard” for your organization. If you are an admin of more than one organization make sure you click the one you'd like to edit. From the Overview Tab of your Admin Dashboard, expand the "Fundraising" Tab to select "Campaigns" from the dropdown that expands. Click the "Manage" button within the campaign you're looking to access. You will see three tabs available within the Campaign Manager. Select the "Donations" tab in the middle to see all donations made for this campaign. From there, click "Message All Donors". Please Note: This feature will only allow you to message donors that have already given to the specific campaign/event. A pop-up window will appear with a subject line and message box where you can create your plain-text message to send to your donors. There is no limit to the number of characters you can include in this message! 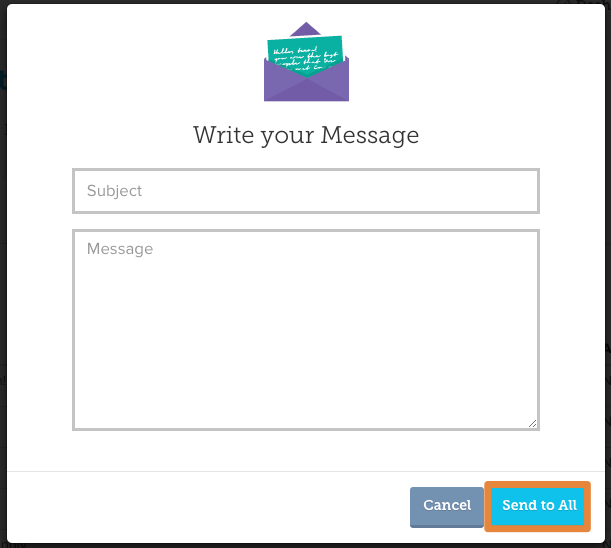 Once your message is complete, click "Send to All" and your message will send automatically! Any replies from your donors will automatically be sent to the inbox of the email you use when signed into GiveGab for easy follow up!